A forgotten part of the past, old industrial sites have had difficulties in being considered « cultural ». Though the abandoned buildings have now begun to interest the public and local actors, a true rehabilitation policy must still be invented, closely correlated with the deeply imprinted working-class memories. 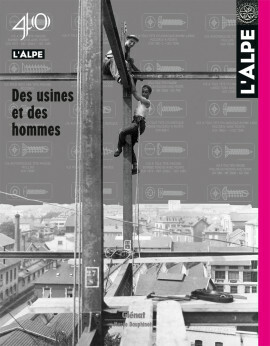 Because the factories and the workers are an essential part of Alpine history. Abandoned industrial sites, the disparaged reminders of the past, are hardly valued in the Valais canton. Factories are razed, but bread ovens are restored. In this part of Switzerland, industry was always considered foreign and rural life judged more interesting than the history of factory workers. And more than contemporary culture which nonetheless has gained a foothold in a handful of rehabilitated buildings. But the going is tough in these eternal post-card landscapes. Factories with built-in living quarters were home for thousands of women workers in the textile industry at the end of the 1800s in Rhône-Alpes. Under the harsh oversight of nuns, young women lived and worked under very hard conditions, subject to strict discipline intended to protect their morality. A form of employer and religious oppression exposed by those in favour of a politically and socially free society at the start of the 1900s. The factory, from cradle to grave… The factory, source of life and death. In whose shadow people lived, worked, loved, had fun and went on strike. A large family with its heartbreaks, cares and joys, a melting pot of people, destinies and nationalities. Where the children learned the rules of life playing soccer among the slag piles from the furnaces. It was the Petit-Cœur factory in the Tarentaise valley (Savoie), in the years following the Second World War. It was not so long ago, but a different era. In the Maurienne valley, the Matussière et Forest paper factory had to be torn down after 150 years of existence. Not that anyone wanted to erase the industrial history of Fourneaux, but for environmental reasons. Only the archives and a few last photographs of the abandoned buildings still recall what was a grand industrial adventure. Face to face, the workers of yesteryear and the unemployed of today. The face-off in these pages highlights a century of change in working conditions in the Isère department. Whether in terms of the hard conditions during the industrial era or the uncertainty permeating our globalised economy, the fight is the same. That living memory, an important part of the heritage and cultural policy of the department, must be preserved, strengthened by exhibitions, publications and the project to establish a museum dedicated to the memory of the working class. A work community based on utopian values, a dream factory sans pareil, the Boimondau company stood out as one of the most different industrial adventures of the last century. In some thirty years of existence, from 1941 to 1972, the watch-case manufacturer became surprisingly well known under the management of two unusual people. First cement, then concrete, two highly robust and flexible materials that can adapt to many uses, had their time of glory in the Alps, in terms of both the manufacturing processes and an array of uses. A large number of buildings have been listed for their heritage value, but the same cannot be said for the production sites. Born when part of the Swiss watch-making industry relocated, the metal turning and cutting sector in the Arve valley (Haute-Savoie) is now number one in the world. In over three centuries, this largely family-based business has produced a remarkable industrial community based on local know-how and skills. This unique and very dynamic immaterial heritage is today threatened by investment funds and relocations. But can this industrial sector be easily relocated ? In 1997, the Dauphiné coal mines shut down. The author, fascinated by mining culture, decided to talk to the former participants. In a book financed by the author in 2007, he brought together lively tales on the life and community of the Matheysin plateau, once a heart-and-soul coal area that has since undergone a difficult conversion and where feelings still run high. Barren hilltops and dark pyramids tower over the brick villages, way up there, toward the otherwise « flat lands ». Carved out of the Earth’s bowels, the abandoned slag heaps slowly erode under the rain or the bulldozers. Taken over by weeds, these « Northern » Alps, produced by sweat and blood, evoke the memories of generations of miners. Should they be recycled, razed ? A photographer and a poet wandered together over these summits of the past, in a new cycle of continuity and change. The picturesque views of Alpine landscapes drew artists as early as the 1700s. Following on the heels of the first travellers, they discovered scenes that lent themselves to great diversity in pictorial expression. Aquarelles, engravings, prints, aquatints and lithographs contributed to spreading images of the mountains and their inhabitants. This profusion of illustrations enchanted tourists and… collectors. Such as Léo Garin and Jean Blanchard, who propose a Voyage au cœur des Alpes drawn from their collections and recently published by Glénat. Excerpts. The legendary hero, William Tell, lies at the heart of the founding myth of the Helvetian Confederation. This symbol of liberty and national identity has enjoyed an incredible posterity. The man and his story are still today told and retold in countless ways, notably on posters as is shown in an exhibition presented in the Swiss national library in Bern.